A "mud-filled medieval ditch" is believed to have caused a sinkhole in a street in Oxford. The hole was discovered outside Boswells department store in Broad Street on Monday evening. Oxford History said a deep man-made ditch around the city's old walls ran along the south side of the street. An investigation by Oxford Direct Services ruled out any drainage faults. The road remains closed with repairs scheduled until 11 September. A spokesperson for Oxford Direct Services said: "[We] believe the cause may be related to a mud-filled medieval ditch in this area. "A more substantial site fence is being installed today. The hole will be filled with foam concrete after which the road surface [will be] reinstated." The investigation was carried out on behalf of the county council, and Thames Water. 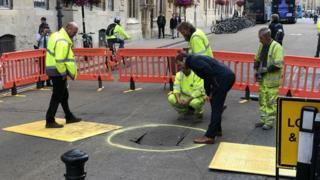 In January a sinkhole was found nearby, outside the Sheldonian Theatre.